The Oduman N3 glass hookah sits at approximately 11" tall and is a modern combination of glass hookah designs with a metal downstem and ports. Speaking of stability, the widest point of the glass base is 7" wide, so you know your hookah will be as stable as physically possible. Wobbly bases are a thing of the past! The N3 downstem comes equipped with a built in diffuser to keep the classic hookah "rumble" to a minimum. 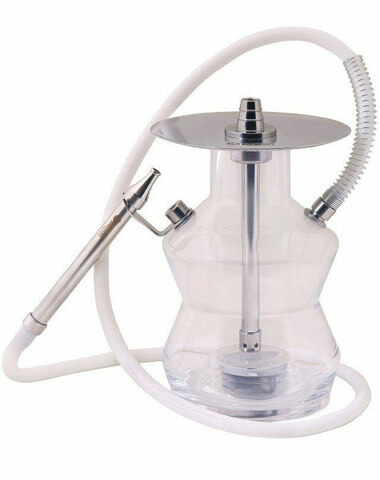 If you've ever been annoyed that a hookah bubbling is getting in the way of your favorite TV show or work flow, then worry no more! This diffuser can also be removed with just a couple of twists. Oduman hookahs also have wide open downstems, so you'll get a smooth session with optimal airflow. These hookahs also have fantastic cloud production due to their open airflow. These N3 hookahs are also equipped with a rust proof ball bearing hidden within the purge valve, so you'll be able to clear your hookah of hot or stale smoke with ease. For added freshness, the N3 includes a washable hookah hose that can easily be cleaned to get all those pesky flavors from your last session out of your hose. For all you party people out there, this hookah will also come equipped with an LED light that turns your hookah into a smoking, party machine. Also included is a remote for you to control your LED light and get that perfect mood lighting. Oduman N3 Glass Hookah has a average rating of 0 stars out of 5 stars based on 0 reviews.